We met Aph Ko in 2015 and had the pleasure of working with her to complete the branding and web design for Black Vegans Rock. We love Aph's ideas and the website, Aphro-ism, which included a collection of essays on black vegan feminist theory by Aph and her sister, Syl Ko. Last year, Aph and Syl turned their website into a book, and they hired us to create the cover art. 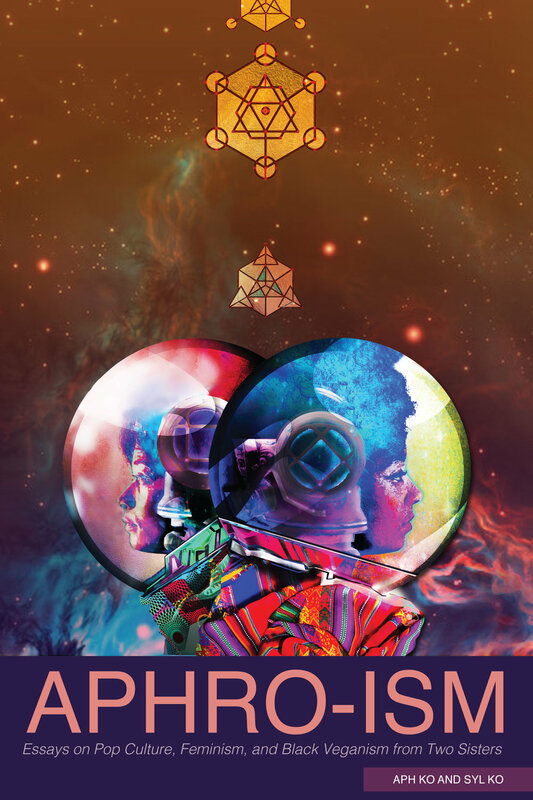 The book is called "Aphro-ism: Essays on Pop Culture, Feminism, and Black Veganism from Two Sisters" and it includes some of their most popular essays from their website in addition to essays that have never been released before. They approach veganism, racial justice and feminism with fresh perspectives that challenge and inspire the ways we think and create. Their breakdown of the human-animal divide, how animality is used to oppress human and non-human animals, and thoughts on reclaiming animality have shaped the way we approach our paintings and designs. We loved visualizing the image to adorn this book, especially given how new and unique Aph and Syl's work is. Aph let us know the concept she had in mind, and she shared artwork she loved with afrofuturist, space vibes. We are in love with the finished piece, and feel that it is representative of the radical, futurist work that lies within.